TAKING your classic car out tomorrow? Then take a picture of it – and get it printed in Classic Car Weekly. Drive-It Day is the nation’s biggest classic car event, with the Federation of British Historic Vehicle Clubs reckoning something in the region of 250,000 historic vehicles taking part each year. It’s not one individual show, but lots of gatherings, runs, tours and rallies all taking place on the same day – this Sunday, 24 April. 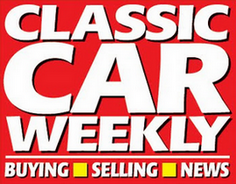 Classic Car Weekly wants to show its support by printing pictures of you enjoying your old car when you take it out this Sunday – so if you send it to us by Monday morning, chances are it’ll appear in next Wednesday’s paper. All you need to do is send us a picture of you with your car – and tell us your name, the year, make and model of your car, and where you’re from, and we’ll sort the rest. Send an email to ccwdriveitday@gmail.com, tweet me and my colleagues a pic at @ClassicCarWkly or share it on Classic Car Weekly‘s Facebook page. It’s not often you get a chance to see your pride and joy in print, but this is definitely one of them!